We chose our name, Tools for Yoga, to reflect our understanding of a yoga lifestyle. Our goal is to make and supply functional and beautiful items that enhance the practice of yoga. We have the "nuts and bolts" for practice made with durable and aesthetic materials. We strive to find ways to make props that are non-toxic and environmentally friendly. Recycled packaging is used whenever possible. Our advertising is low key and selective so that you can find us when you need us. Until the advent of e-commerce the only way for you to see our extraordinary fabrics, or the quality of our woodworking, was to visit our store. we carry and to provide you with instructional information on yoga and the use of yoga props. 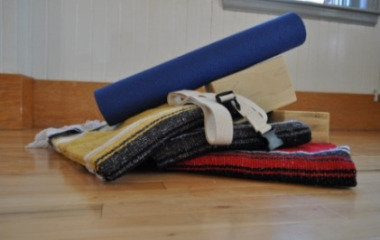 Props are now used to support, open, enable and enhance the practice of meditation, yogasana and pranayama. Various supports have been used throughout history but it is BKS Iyengar who has really developed the use of props. For his own personal practice Iyengar searched for items to help him open and support specific areas of his body. He went to the street for bricks and there he also found big drums to bend backward over. And of course it is common in Indian homes to find bolsters and stools. When teaching he found that it was helpful to support his students with his hands. This worked well for one student, and perhaps two at a time. But when teaching three or more he needed "extra hands". So he devised props to support the students in positions. and simply be able to take the shape of poses in order to derive the benefits of each pose. Props are also helpful in building greater awareness. And sometimes we use them just for fun! Whenever Iyengar is visiting his students from the west we look to our commonplace items: dowels, chairs and rug underlay. These items have proved to be so useful that we carry them to India for the classes there. Our first thanks goes to BKS Iyengar of Pune, India. His designs form the basis of what are known as "yoga props". We also thank our loyal customers. Many have been with us since 1979. And a Special Thanks to the founder of our store Theresa Rowland for her guidance and devotion to yoga. Unlike many online sites, an actual person sees your order before your credit card is charged. In this way we can customize your order. At the end of the order page there is a box for any specific comments, suggestions or instructions you may have.